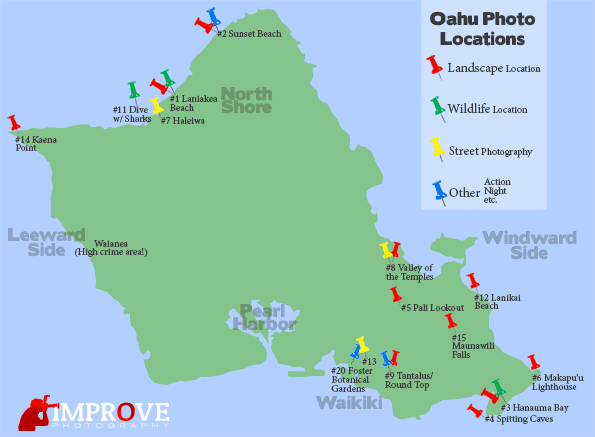 Although this map shows lots of great locations on the southeast corner of the island, I HIGHLY recommend staying on the North Shore where it is much less touristy and has much less traffic. Hit the locations in the southeast on a day trip since it is only an hour away. Last week I asked the Improve Photography community on Facebook (thanks guys!) 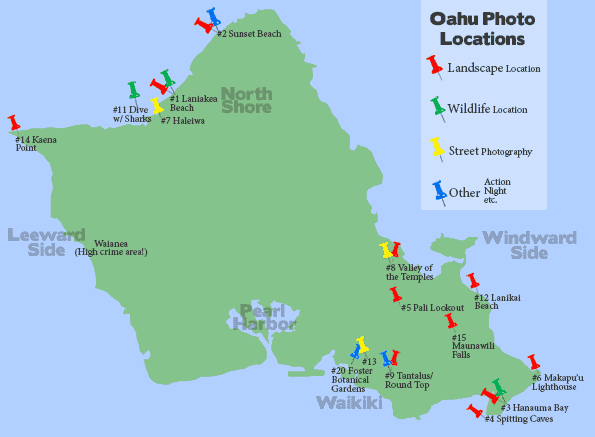 what their favorite photography locations are on Oahu, Hawaii. I received dozens of responses from locals in Hawaii to add to my own knowledge of the area since I used to live there and recently went back again for a photo adventure. IMPORTANT TIP! Since publishing this article, we created the ULTIMATE tool for planning a photography trip to Oahu. It's called Really Good Photo Spots. It's a free iPhone and iPad app with THOUSANDS of the best photo locations in the world all in one app, and Hawaii is especially well-covered. It's really convenient for travel photography because you can just tap “Spots near me” and BOOM! It lists all the best spots to take pictures near you. Download really Good Photo Spots for the iPhone or iPad right here. The North Shore of Oahu (only 1 hour from Waikiki) is home to a beach with plentiful bright green algae that the turtles love. On a given afternoon, there are often as many as 20 turtles basking in the sun on the sand and in the shallows of the water. The “Turtle beach” as it has become known, is home to turtles year round. However, they are easier to find in the summer, spring, and fall when the waves are not as large. 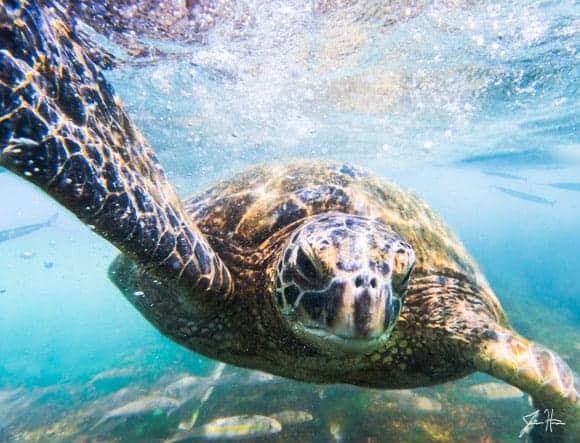 In addition to shooting the turtles at this beach, also consider using the bright green algae on the rocks and the beautiful outcropping of trees on the right side of the beach as a location for a sunset shoot! Directions: The easiest way is if you simply put the address “61635 Kamehameha Highway” in your GPS or phone. There is no sign at the beach marking that it is Laniakea beach, but you won't miss it–the turtles will give it away! Best time to go: Spring, summer, and fall between 10AM and 5PM. The turtles sometimes stay until sunset, but they are mostly there for the warm sun, so they aren't as prevalent on the beach at night. A photo I took at Laniakea Beach. Sunset Beach is the most dangerous beach on Oahu–by a long shot! It is home to towering and powerful waves year round, but especially in the winter. Only the strongest and most experienced swimmers should venture into the water when the waves are up, but if you're aware of that warning then you should also know that it is an excellent location for photography. If you're brave and a good swimmer, then shooting the shorebreak can produce spectacular photos. For landscape photographers, look for the lookout areas surrounding this beach where you can shoot the sunrise as the light hits the rocks below. For sports photographers, you'll find some of the most exciting and adventurous surfing scenes in the world. Directions: Sunset Beach is located on the North Shore at 59-104 Kamehameha Highway in Haleiwa. 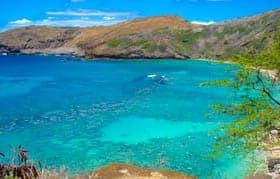 Hanauma Bay – Snorkeling capital of the world! Hanuma Bay is, hands down, the best snorkeling location on the planet. Bring your underwater camera or use an inexpensive EWA-Marine housing for your DSLR or underwater bag for your smart phone camera. The water in this area is very calm because of the shape of the bay and the fish are plentiful on the coral reef. If you skip this spot, you didn't go on a true Hawaiian vacation. This is primarily a location for underwater photos, but also the view of the bay from the top of the hill is spectacular! Directions: When you arrive and park, they make you watch a short 5 minute video warning you not to touch the turtles and then you can go down to the beach. The beach is a short downhill walk, or you can ride the little trolley. Best time to go: Arrive early before the crowds. The location is open year round and photography is good any time of year. Spitting Caves is a location that not even many locals know about. It has virtually no tourist pressure and is a gorgeous location for landscape photography. The location is a point on a cliff overlooking crashing waves below. There is a small cave down low that causes the waves to “spit” up, and it looks fantastic. Click the video on the right to see what it looks like. Directions: This spot is at the very end of Lumahai Street. If it looks like you are lost in a residential neighborhood, you are in the right spot. There is a yellow marker with “119” on an empty lot, which is where you will enter. The Pali Lookout is well known among locals but is not yet a major tourist destination. The Pali is an amazing overlook over the island. It can be difficult to take good landscape photos at an overlook because there is nothing in the foreground to allow for scale or depth in the photo, but this view is so fantastic that any photographer would have a difficult time not bringing out a camera for a gorgeous panoramic shot of the island from here. For the ladies, you will probably want to do your hair up when visiting the Pali because the wind at the top parking lot is incredibly strong since you are so high in the air. There are also some excellent hikes along the Pali highway, so be on the lookout for little dirt trails heading off the side of the road if you want a rainforest adventure. Directions: Simply type the Pali Lookout in your GPS and you'll find it. You may find it called “Nu'uanu Pali Lookout” as well. From Waikiki, take H1 east and then head toward the Pali Highway (Route 61). Follow the signs to the lookout. The Makapu'u Lighthouse is a trail leading about a mile up a paved pathway that is fairly steep. The views at the top are of the lighthouse below (inaccessible by the public) as well as a sweeping vista of the ocean and islands below. I remember visiting this location as a young boy and thinking I had never seen anything so beautiful. This is one of my favorite places on the island. Directions: Directions are available here. Best time to visit: It is recommended to visit this location a few hours after sunrise. At sunrise the water below is dark and doesn't look good in photos. This is one of those rare locations where the good light happens around 10AM when the sun lights up the electric blue water below. Picture a bunch of hippie surfers from around the world congregating in just one city, and you understand Haleiwa. During the winter months, this is the surfer capital of the world, and it makes for fantastic street photography. Also, do NOT miss grabbing a shaved ice from Matsumoto's famous shaved ice stand in Haleiwa. This little shaved ice shack has attracted celebrities from around the world for its fantastic shaved ice. This is a terrific location for architectural and landscape photography. The most famous temple in the valley is the Byodo-In temple, a Buddhist temple modeled after a 900 year-old temple in Japan. This location provides gorgeous buildings to photograph in manicured gardens. The Tantalus/Round Top area is an awesome location for shooting from an overlook to see the entire city. As I mentioned previously, I usually don't think of overlooks as photography locations because it is impossible to compose with nothing in the foreground; however, this location makes the list because of the possibilities it offers at night. At night, this is a fantastic spot for shooting the lights in the city below, the clouds close above you, and the ocean in the distance. It makes for a fantastic shot, and one that most tourists would never think of taking. I usually find that it is mostly beginner and intermediate photographers who are interested in flower photography. Usually the pros like shooting other types of photography since they generally feel that all flower photos look the same. However, it is still fun to do and you'll end up with great photos by visiting the beautiful Foster Botanical Gardens. Admission is $5 for adults. Galapagos Shark. I took this photo on my dive with North Shore Shark Adventures. Awesome shark cage experience! 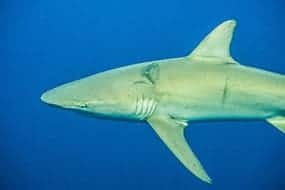 If you really want to capture unique photos while in Hawaii, consider doing a shark cage dive with North Shore Shark Adventures or any of the several other companies on the island. They take you out on a boat about a mile from the shore and give you a snorkel and put you in a metal shark cage. On my trip with North Shore Shark Adventures, I saw well over a dozen sharks during the 10 minutes I spent in the cage. The sharks came right up close to the cage, but it actually was not as scary as I anticipated it being. The sharks are not aggressive because North Shore Shark Adventures does not chum. The sharks are naturally attracted to the boat because they think it is a crabbing boat where they can grab a snack! If you go dive with the sharks, I HIGHLY recommend going early in the morning. The waves get too high later in the day and the company has to cancel 40% of their shark tours because there is too much risk of putting people in the cage with high waves. GO EARLY IN THE MORNING! The cost is a little under $100. No, this is not a repeat of #1. That's Laniakea Beach, and this is Lanikai Beach. Lanikai Beach is a favorite spot for local photographers to shoot the morning sunrise. Lanikai beach is a great place for photography because it offers palm trees close to the water, the Mokulua islands in the bay, and other natural features that add a lot of needed interest to a beach landscape photo. You can also rent a kayak here and take it out to the islands in the water for a view of undisturbed Hawaii. There is a China town in most cities, and I always try to visit China town when I travel. China town is excellent for street photography because it is such a departure from what most people see day-to-day (unless you live in Asia, of course!). It seems that wherever you point your camera in China town, you find an interesting face, colorful designs on buildings, and unique shops. It also seems that wherever you point your nose will lead you to great food. China Town in Hawaii is in downtown Honolulu. More information here. Kaena Point is a mile-long strip of beach on the western-most tip of the Island of Oahu. What makes this a great photography location is that it is under very little tourist pressure and offers sweeping views of the ocean bordered by a beautiful beach and the rugged Waianea Mountains. The undiscovered nature of Kaena Point also makes it a great spot to find wildlife. If you are lucky, you may even catch a glimpse of the endangered Hawaiian Monk Seal on the beach! The only way to get to Kaena Point is on foot via one of two short trails. More info on the trails here. Also be cautious of swimming at Kaena Point at certain times of year when the ocean can become very rough. More adventurous photographers who want to get away from the beach for an afternoon and who are willing to hike through the muddiest section of trail you've ever imagined will be rewarded with views of a gorgeous waterfall in a lush forest by visiting Maunawili Falls. The hike is only about 3 miles and can usually be done in approximately an hour and a half if conditions aren't too muddy. Be sure to bring mosquito repelent! Directions: If you are driving through a residential neighborhood and thinking you must not be anywhere near the trailhead, you're close. Turn by turn directions available here. Best time to go: Early in the morning. Later in the day this becomes a favorite swimming hole for locals. Go early and you may have the place to yourself. If you're headed to Hawaii, you have a long plane ride ahead of you. Consider subscribing to my FREE photography tips podcast so you can learn a little about photography while you're on the plane. Listen to episode 34, where I give a report of my Hawaii photo shoot and give some tips for travel photography in Hawaii.